Introduced by the Schreiner family in 1964, Stepping Out quickly became a popular garden Iris. This superb plicata specimen could be found in the Top 10 of the American Iris Society‘s “100 Most Popular Bearded Iris” list year after year. And it’s no surprise why! Stepping Out, a rich violet and white plicata, strikingly picoteed, was awarded the AIS Honorable Mention medal in 1965, the AIS Award of Merit in 1967, and the premium award for a Bearded Iris, the Dykes Medal, in 1968. We are proud to celebrate Stepping Out’s 50th birthday this year! Categories: bearded iris, Historical Iris, iris farm, iris nursery, iris societies, iris society, Schreiner's | Tags: bearded iris, iris, Schreiner's Iris Gardens | Permalink. 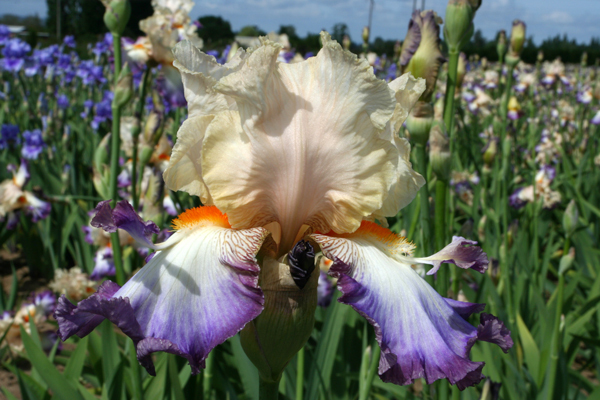 We congratulate William Shear of Virginia on his winning entry in this year’s Iris Naming Contest, “Wings At Dawn”. The flounces at the tips of the sunny beards of this all-new introduction for 2014 lift away like birds at daybreak. Mr. Shear will receive a $25 gift certificate to Schreiner’s Iris Gardens and one rhizome of “Wings At Dawn”. 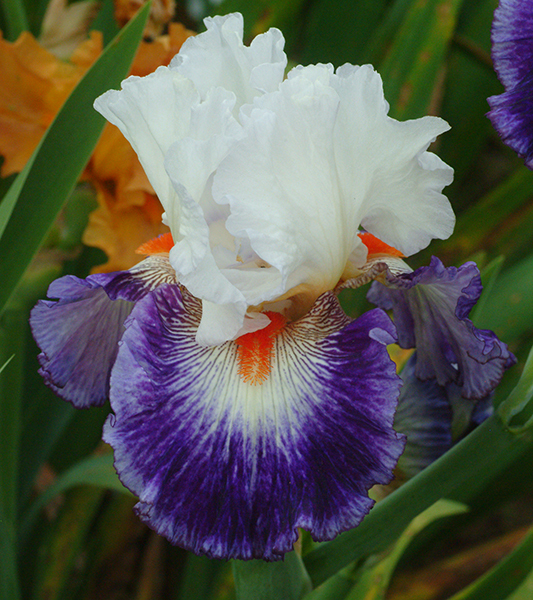 We thank all who submitted entries for the 2013 Iris Naming Contest. Selecting one name from the hundreds of creative and thoughtful suggestions is never an easy task and is truly a group effort. We were drawn to the name that best reflected the perceived motion of the flounces lifting away from the standards. The appendages on this radiant beauty were pure happenstance, according to Ray Schreiner; it was not intentionally bred. The story of the intentional breeding of Iris sporting horns, spoons and flounces reveals a bit of serendipity as well. Read on…. The odd protrusions from the tips of the beards, once decried by some Irisarians as “monstrosities”, were launched into the Iris breeding world and landed themselves a spot in Iris history in the early 1950’s. The late Lloyd Austin (1898-1963) cultivated the Iris oddities, hatching the idea after a fortuitous visit to the gardens of Sydney Mitchell (1878-1951) in Placerville, CA in the late 1940’s. (This is the very same Mitchell after whom the American Iris Society’s “Sydney B. Mitchel Medal” is named.) The story goes that Mitchell had no interest in these errant traits among his Iris crosses, and willingly offered the seedlings to his friend. Mr. Austin worked with these unique seedlings, crossing them at his gardens, until he achieved the horns, spoons and flounces and even double appendages at the ends of the beards, thus launching the niche of the “Space Age” Iris. Lloyd Austin’s first horned introduction was “Unicorn” in 1954. 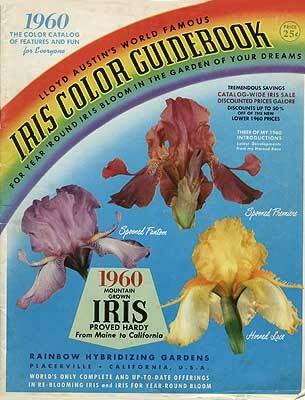 Throughout the 1960’s, Lloyd Austin promoted the unusually adorned Iris through his colorful catalogs (see image). Check this link for more on the story of Lloyd Austin and his 1954 debut with “Unicorn” on the American Iris Society’s “World of Irises” blog. Several breeders have carried on the “space” program with great success, despite the opinion still maintained by some Irisarians that these appendages are a distraction or unpleasant. 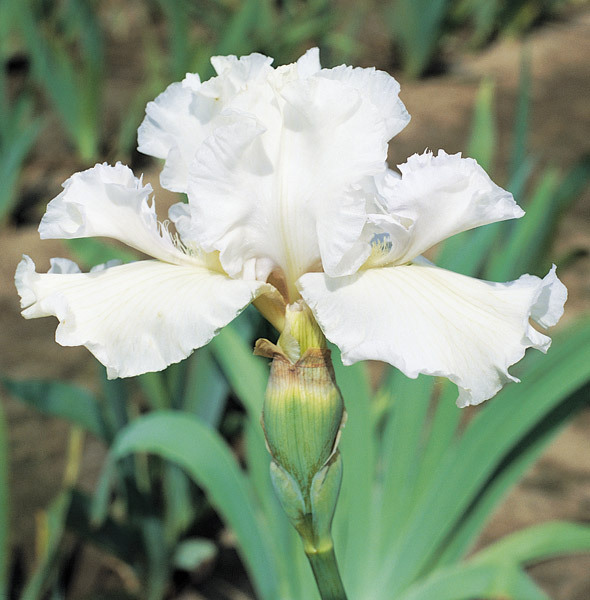 The late Monty Byers, for starters, introduced several award-winning winged, horned or spooned Iris over the years. Take a look at Thornbird (Dykes Medal 1997), Conjuration (Dykes Medal 1998), and Mesmerizer (Dykes Medal 2002) for starters. Lawrence Ransom (“Punk”, 1998; “Three Two One Lift Off”, 2008) and Tom Burseen (“I Wuv Woses”, 2008) also have bred wonderful, fun “space agers”. Again, thank you to all who submitted entries in this year’s Iris Naming Contest. Try your luck again next year. Look for the contest announcement in the Fall of 2014. And thank you for choosing Schreiner’s Iris Gardens! We are so very grateful to all of our fans, customers and acquaintances. Happy Thanksgiving! The above information on the birth of “space age” iris was adapted from passages from the World of Irises, and publications by Kelly Norris (A Guide to Bearded Irises), and William Shear (The Gardener’s Iris Book – out of print). 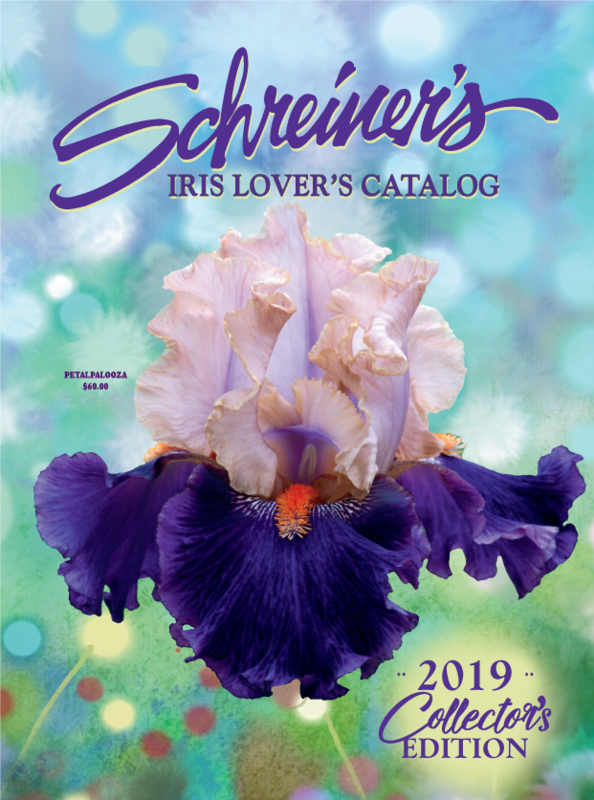 Categories: bearded iris, Garden Design, iris, Iris Contest, iris societies, iris society, Naming Iris, Schreiner's, space age iris, Uncategorized | Tags: bearded iris, Garden Design, iris, Iris Societies, naming contest, Schreiner's Iris Gardens, space age iris | Permalink.